Planning your family’s meal doesn’t start and end with deciding on the menu. It also includes using clean and high-quality kitchen utensils that ensure a hygienic and safe food preparation process. From knives, ladles, pans, cups, and cutting boards, high-quality materials must be considered. One important equipment that you must give a meticulous thought of is the cutting board. Considering a wide market of cutting boards, nowadays, choosing the best material can be quite challenging. An end grain cutting board is, by far, one of the best cutting boards to use. There are factors that you must consider, as well as the brand, quality, and specifications that will fit your preference. 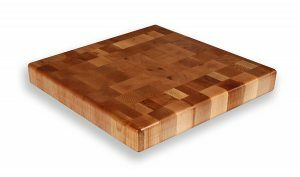 Below is a list of the things that you must consider when buying an end grain cutting board. An end grain cutting board is popularly used because of many reasons, such as durability, efficiency when it comes to knife impacts, the sanitation requirement before and after using the board, and the price. When talking about the cutting board’s durability, the material or the type of wood used in making the board is the one being judged. Some of the best wood types which are commonly used in making end grain cutting boards are hard maple, walnut, oak, cherry, bamboo, and birch wood. One advantage of using an end grain cutting board is its ability to stand cutting edges, making wood fibers last longer. These woods, when cut in approximately 2 ½ to 3 ½ thickness, are strong enough to withstand impact, keeping them from splitting easily. Depending on the ingredients that you want to slice, using the board with the appropriate thickness will help make the board last longer. Whether you use a board similar to a butcher’s block or just a smaller cutting board for your spices, make sure to buy high-quality and durable cutting boards. In terms of sanitation, end grain cutting boards are known to keep bacteria from growing. Of course, this depends on the type of wood used. Hardwoods are the best-known materials used for cutting boards. Since wood is known to be porous by nature bacteria are sucked inside the board, depriving them of moisture, resulting in their deaths. End grain cutting boards when compared to long grain cutting boards and other kinds of boards in the market are not that easy to make, thus making it more expensive that the rest. However, the price can be relative to quality and vice-versa, as well as the type of wood used. So, which do you prefer? An end grain cutting board or another type of board? Which material of wood will you pick? 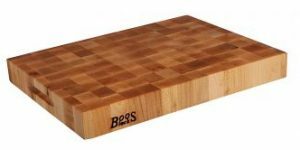 If you prefer to use an end grain cutting board, you need to know the different brands of boards, their features, advantages, and downsides. Acacia is one of the popular wood types used in making cutting boards and butcher block because of its unique “Chatoyancy” feature, which is its ability to glimmer in various lighting conditions, and durability. Even when some hardwoods came into the market – maple, oak, cherry – this classic wood still made the top of the rank. Having a solid and reliable cutting space is essential in preparing the best meal for your family. However, amidst a huge selection of wooden cutting boards in the market nowadays, the hard rock maple species has always been acknowledged as one of the best hardwoods to be used in making cutting boards. It is because of its limitless abundance all year round and one of the native wood species that can easily adapt to the long winters and summers. Also, because it is solid in nature, this type of hardwood can guarantee you with durability and strength even when used a number of times in a day. Lastly, because maple hardwood is dense, bacterial growth is impossible when used as a cutting board. Because it is richly reproduced in the country, the price is also more affordable compared with other hardwood-made cutting boards. Yes, bamboo is not a wood, but a grass. However, when made into cutting boards, this material surpasses other wood types in terms of durability, strength, beauty, and affordability. Because this market staple is a renewable resource, it is relatively cheaper than other kinds of cutting boards. Lastly, bamboos are known to be strong and resistant to bacteria, thus making food preparation safe and clean. 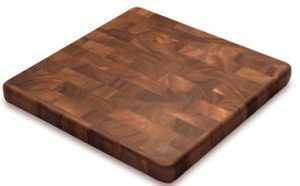 This Acacia Hardwood End Grain Cutting Board with Juice Groove is designed to give you a convenient food preparation process. Since it is made of the finest dark Acacia wood, you can be assured that it is durable and long-lasting, and it doesn’t make your knife blunt like what other regular boards do. This Acacia hardwood from Mountain Woods is made of the finest quality and design, making it easier to handle and use. Its advantages outweigh its downsides, thus making this end grain cutting board popular in the market. 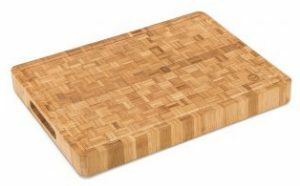 This large bamboo-made end grain cutting board is made with eco-friendly bamboo cuttings. It won’t cut knife as what other types of cutting boards do. Made with rubber feet, this board keeps itself from slipping while slicing on it. Also, it can be used as a serving tray for food and beverages. Bamboo cuttings are the newest trend today when it comes to making cutting boards. Why? It is because of the durability and anti-microbial properties that this grass possesses. Also, Bamboo-made boards are more eco-friendly and affordable for the majority of the market. So, having this kind of cutting board in your kitchen is a wise investment. 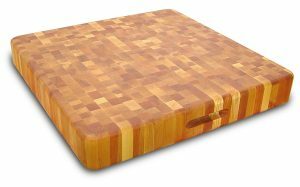 This thick Acacia wood end grain cutting board from Hardwood Chef Premium is crafted with perfection. Built durable, it resists warping, as well as making your knife dull over time. Soaking it with mineral before using it for the first time will make your cutting board last longer. Having this Acacia-made end grain cutting board in your kitchen can be one of the best investments. With its durable and easy-handling features, this wooden board can be a great kitchen partner anytime! Taking care of this simply elegant cutting board is the best way to make it last long! 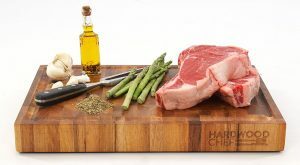 Crafted with intricate wood master, Michigan Maple Block, this hardwood maple end grain cutting board gives you the convenience and efficiency that you deserve in preparing your food. Whether you chop raw meat or slice soft and luscious veggies and fruits, this wooden board will never make your knife blunt. Regular washing and oil application will make it lasts longer as well. 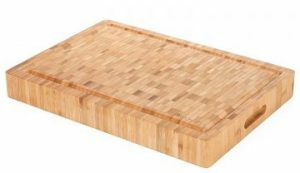 Lightweight despite its solid material, easy to clean and maintain, and convenient to store, this maple-made end grain cutting board is one of the best kitchen essentials you can have. Investing on high-quality boards like this one can save you hundreds of bucks from food wastage and blunt knives. This end grain cutting board from John Boos is designed using a hard rock maple in a highly sophisticated process to give you the best tool in your kitchen. With its oil-finished surface, cutting meat, slicing veggies and fruits, and mincing spicy herbs will not dull your knife that fast as other cutting boards do. With proper handling and care, your piece of cutting block from John Boos will give you the surest food prep convenience. John Boos cutting boards are made from the finest materials to give you high-quality end grain cutting boards. Made with sophistication, this product doesn’t just possess elegant looks but efficiency-based features like hard surface, hand grooves for easy handling, and convenience for cleaning and maintaining. Make this cutting block one of your most trusted kitchen tools! 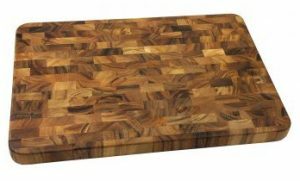 A medium-sized end grain cutting board made of Acacia hardwood will make food preparation convenient. Since this is made of wood, you are assured that it can be resilient to wear and tear, yet doesn’t dull your knife. One of the unique features of an Acacia wood is its ability to glimmer when light is reflected on the surface of the board. Since the board is made of wood, warping and cracking may result due to leaving it dry and unused for a longer period of time. Applying regularly with beeswax or mineral oil will prevent this from happening. Patches may appear after a number of uses. However, sanding the surface can make the wood good as new. Acacia hardwood is one of the best wood types to be used in making cutting boards. Having it crafted in an end grain manufacturing process will make the wood more durable than any other types of cutting boards and butcher blocks. With proper care and handling, this cutting board will serve you a long time. This end grain cutting board is crafted from the hardwood maple of Northern Michigan and is certified by the National Sanitation Foundation (NSF). Designed with a ⅜” radius top and bottom smooth edges that make handling safe and easy. Having a durable cutting board that is end grain-manufactured assures you of a convenient meal preparation. Added with its knife-friendly features, this maple end grain chopping block can be one of your best investments. Since this end grain bamboo cutting board is made of the organic non-porous Moso bamboo species, it is proven to resist the growth of bacteria in between wood fibers. Also, this cutting board is made and certified to be BPA-free and toxin-free. It is multi-functional – best for cutlery and chopping. Bamboo-made cutting boards as expected won’t last long like a hardwood board does. Nonetheless, it is durability and of excellent grade. This bamboo end-grain cutting board from Heim Concept is one of the best cutting boards to use when you opt to use organic materials. With the bamboo’s ability to resist stains and warping, you can be assured that you get the best kitchen partner. 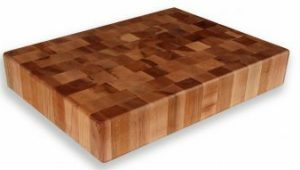 Catskill Craftsmen Super Slab with Finger Grooves end grain cutting board is made to be one of the best kitchen essentials that you can have. It is oiled finish, thus preventing your knife from becoming blunt. Also, it comes with an easy slip finger slots design for easy handling. 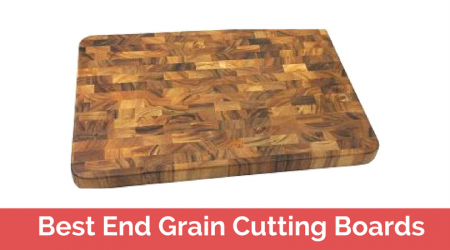 This is an easy-to-handle end-grain cutting board and is fit for preparing large meals. Made of hardwood, easy to clean and maintain, and easy to store despite its huge size. Simple washing with warm soapy water and oil application will make the board last longer. This end grain cutting board is made of Acacia hardwood with its unique “Chatoyancy” feature or to shimmer under different lighting conditions. Since it is made of a cost-effective material, you can be assured that the board can withstand wear and tear from regular use. Also, this Acacia-made cutting board is easy to maintain and clean with just the use of warm soapy water and air drying. Because it is made of wood, warping may be possible. However, placing the board on a mat and air drying after use can minimize the problem. 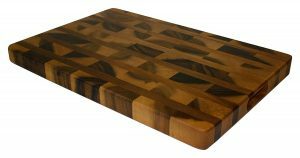 This end grain cutting board from Ironwood Gourmet is made with the finest Acacia hardwood that will give you a durable kitchen partner. It is easy to handle, easy to clean, and will deter splitting. With these qualities, you can call it a worthy investment. Whatever type of wood you choose for your cutting board, proper cleaning and handling is the key to making this kitchen partner last longer. Investing in this kitchen essential can make your food preparation hassle-free, as well as making your expensive knives protected from dullness!